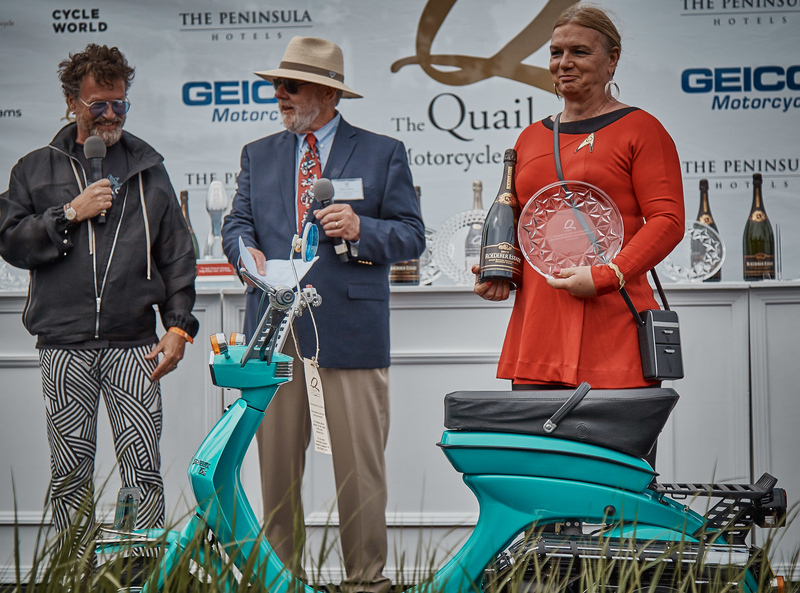 I love the Quail Motorcycle Gathering. It’s the perfect combination of motorcycles, people, and ambience – and it’s even better for residents of Southern California because it gives us a great excuse to ride up and down some of California’s best roads. This was my 4th straight year of attendance at the Quail, and I want to share my highlights with you. Part of the fun is figuring out what bike I want to ride to the event. This year I chose to take a Yamaha MT-07 because I didn’t get enough time with it at the rain-infused launch in Spain back in March. I’ll have a more comprehensive review for you in the future, but I absolutely adore this bike, especially considering the price. This year I rode up with Julia LaPalme and Will Steenrod. Will rode a Kawasaki Versys 1000, while Julia was on the new Ducati Monster 797. The Monster was a great choice as this is the 25th year of the model and there was a mini-celebration of this fact scheduled at the Quail. If you missed it, Julia recently shared her account of the trip on Bike-urious. Julia decided to combine her trip with her love of camping. Throughout the day we were joined by a few friends – Mike Ngo from IXS, Shane Pacillo from Piaggio, and by the end of the day, even Nathan had caught up even though he left Los Angeles about 6 hours after I did! Nathan was on a Kawasaki Ninja 1000, and when we encountered long stretches of straightaways he would leave me behind like my throttle cable was broken. That bike is fast, though he didn’t have a cool passenger like Baby Jack! Because of the road closures on PCH (which may be sorted out by September), there was a large portion of the iconic road with almost no traffic. This might have encouraged us to goof around a little bit. Turns out the MT-07 is one of the easiest bikes to wheelie I’ve ever ridden, but I don’t think that counts as practical consumer advice. We spent most of the day enjoying what PCH had to offer, and then I wanted to try something at Bixby Bridge. Portions of PCH are enjoyable just from a pavement standpoint – there’s a bounty of high speed sweepers and undulating elevation changes to enjoy. You can find those characteristics in many roads across the country, but what makes this so special is the view afforded by coastline. There are so many great spots to hop off the bike and take it all in. It’ll slow you down, but it’s well worth it. You always have to enjoy your time off the bike as well. Enough about that. PCH is great, you get it. Let’s see some bikes! Part of the charm of the Quail Motorcycle Gathering is the beautiful venue. If you’re looking to debut an expensive new model to well-heeled enthusiasts, I’m not sure there’s a better place to do so than the Quail. Curtiss Motorcycle Co. (an evolution of Confederate Motors) chose the venue to show off their electric prototype called Zeus. Their current (pun intended) expectation is that it will be available in 2020, but there’s still a shocking (OK, I’ll stop) amount of work to be done! Mr. Cornille is absolutely right, and it’s going to be fun seeing how companies determine what the new standard of motorcycle design will be. But here’s a unpopular opinion: I don’t like the Curtiss. I think it’s cool because it’s so different (and it won the Innovation Award at the Quail), but the style just doesn’t work for me. Check out more images on the Curtiss site and decide for yourself! Sadly, I thought it looked better under the cover. What do you think? Curtiss seems to enjoy breaking news at fancy events like this. Last year they announced their partnership with Zero and name change from Confederate at Pebble Beach. At the time, they stated that future models would be electric, but they did sneak in one last gas-powered bike. Curtiss calls it the Warhawk, though fans of the former brand will notice that it’s basically a Confederate P51 Fighter that’s been dressed-up. I thought the Confederate Fighter was a revolution when it was first revealed about a decade ago. This Curtiss model just feels like a way to get rid of 35 bikes left in inventory. If you disagree with me, you can snag the last gas-powered Curtiss for $105,000. There’s always great private collections – one of my favorites this year was a series of rotary-powered motorcycles owned by Stephen Haddad. This is a Norton Classic – 1 of 100 produced. This was Norton’s first rotary-powered street bike that the public could buy. MSRP was $8,500, and Norton claimed the air-cooled Wankel motor put out 79 horsepower. Norton F1 in gorgeous John Player livery. Based on the RCW588 racer, this used a 588cc twin-rotor Wankel motor that was liquid-cooled. Don Stockett (left) and a fellow judge evaluate a rotary-powered Suzuki RE-5. Vincent Schardt brought a few interesting two-wheelers, but I was most intrigued by this tiny scooter. It’s adorable, but I couldn’t figure out exactly what it was! Any ideas? While we’re checking out scooters – there were a few interesting ones brought by Siobhan Ellis. This 1971 NYPD Lambretta LI150 Special won the Extraordinary Bicycles/Scooter Class Award at last year’s Quail. This is a 1969 Lambretta Vega – per Siobhan it was Lambretta’s launch vehicle for Australia. This specific example (BK207) was apparently used in some of Lambretta’s marketing materials. The Vega ended up winning the Extraordinary Bicycles/Scooter Class Award this year. Congrats to Siobhan for two straight victories! Siobhan’s wearing a Star Trek outfit because that’s what one of the models was wearing in promotional materials when the Vega was sold in Australia. Another private collection was from Seth LaForge, who used to work at the former electric motorcycle company Mission and apparently now owns all of their assets. This is Mission One, the original prototype. If you missed it at Quail, you can still see it at the Custom Revolution museum exhibit that Paul d’Orleans put together! This V11 Le Mans came with a separate engine cutaway. This one’s for commenter Rod – it’s a Janus Halcyon 250. This little Indian ended up winning the “Why We Ride” Award. Gordon McCall (the man behind the Quail) chats in the background, second from the right. The Electric class was full of interesting motorcycles, including a trifecta of Corbin specials. This is “Quick Silver”. It set a speed record for electric bikes at Bonneville on August 19, 1974 by completing the flying kilometer at 165.367 miles per hour. It’s 9 feet, 6 inches long, weighs 772 pounds, and the name came from the fact that it ran silver-zinc batteries (as opposed to the usual lead-acid) supplied by the Yardeny Electric Company of Pawcatuck, Connecticut. This is one of the 100 examples of the Corbin XLP-1. It could hit 30 miles per hour and offered a 30 mile range. Charge time was 3 hours. It was the first electric motorcycle to be registered for the street! Per a flyer hanging off the bike, the single speed model cost $1,395 and the two speed was $1,495. Corbin claimed an operating cost of 1 cent per 5 miles. This Corbin-Yardney build won the first annual “alternative vehicle regatta”, which challenged vehicles to get to the top of Mt. Washington in New Hampshire – here’s a picture of Corbin’s bike at the top. It was an eight mile trip with an average grade of 12%, and this bike was able to do it in 26 minutes. One of my favorite aspects of this year’s Quail was that they brought all the past winners of “Best of Show” together! The winner in 2015 was this incredible bike is a 1957 Mondial DOHC 250cc Grand Prix Racebike. Ridden by Tarquinio Provini, it won the ’57 Italian Championship and placed 2nd over the entire season. This was the last year that Grand Prix racing allowed dustbin fairings. In the center was the 2013 winner – Wayne Rainey’s 1991 World Championship winning Yamaha YZR500. Arlen Ness was named a “Legend of the Sport” at the Quail. To be frank, his builds don’t normally appeal to me so I didn’t spend too much time in this section, but one of them was absolutely breathtaking. It’s called “SmoothNess”, and in a 1997 New York Times article Arlen said it was inspired by a Bugatti. 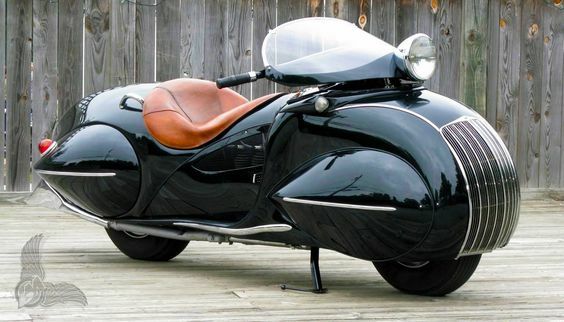 It makes me think of the legendary 1930 Henderson KJ Streamliner that Orley Raymond Courtney customized as what would become a prototype of sorts for his Enterprise. This bike was a great platform for Arlen to show off the parts he sells – like the exhaust. This 1961 BSA DBD34 Gold Star was an absolute jewel. The owner ended up chatting with Nathan and when I heard the story I made a point of asking if we could come back to film a video of him…but we ran out of time! I’m still annoyed about that, because the story is as cool as the bike! Nathan speaks with the owner of this beautiful BSA. It ended up winning the “Cafe Racers” Award. This adorable Bantam won 1st Place in the British class. It’s owned by the same gentlemen who owns the Gold Star up above. This MKM Krauser was at the show last year, but it’s so cool that I have to share it again. Here’s a video from the last time I encountered this rare BMW-based custom. The owner actually offered it on eBay last June but the bike got no interest at the opening ask of $28,000. Another eventual winner was this 1983 Honda RS750 factory flat tracker, which won the “AMA Motorcycle Hall of Fame Heritage Award”. This was Honda’s 2nd attempt at a flat track racer, and it led to multiple championships. Don Stockett (far left) judges a Flying Dragon CL450. The fun side of Burt Munro’s Indian Land Speed record holder. This would go on to win the Spirit of The Quail Award. Arch showed off their new Method 143, which is claimed to be the first concept production motorcycle with a carbon fiber mono-cell chassis. The details are exquisite, so head on over to the Arch site for more pictures. Seeing one 750S in person is amazing enough. But two right next to each other? Stuff like this is why i love the Quail. Once the judges are done, votes are tallied and it’s time to announce the winners. For a full list and corresponding images of the winning bikes, check out this previous story on Bike-urious. The awards are ready to be given out! Over 350 bikes were on display, and Best of Show went to this 1913 Flying Merkel Twin owned by Douglas & Marian McKenzie. Marc Crocetti – the builder of the Crocetti Special I featured last year. Robb Talbott owns Moto Talbott – a museum that should be required viewing for any rider in the area. Luis Herrera of Soul Motor Co in Mexico City. He introduced himself to me at the OG Moto Show and we’ve seen each other 4 times in the couple of months since. Don Stockett is the man behind Vintage Motorcycle Rescue as well as the head of the Japanese Class Judges. I met Heath Cofran when he was running Technical Media Services for Alpinestars. Now he’s the Director of Sales and Marketing at Arch Motorcycle, which means he gets to play with the Suter MMX 500! I’d call him lucky, but he’s earned it. Michael Larsen – you may know him as the Urban Monk! Looks like he’s got excellent taste in t-shirts. Don Potter and his wife. Don hosted Nathan and I a few weeks ago so that we could do a story with our Z900RS loaner and his early Z1. Don and I on his Z1 and the new Z900RS. I promise I’m still working on a video for this! I also got to meet some new friends and readers that I’ve chatted with online but never seen in person before! Larry Kahn! I profiled him years ago and it was great to finally meet him in person, even if we didn’t get to chat as much as I wanted to. Great shirt. Blayne Osborn rode out from Nevada to come check out what the Quail had to offer. I really appreciated everyone that came up to say hi, it makes spending the time on this site worth it! Simon Graham – his MV Agusta 750S was a previous Best of Show winner. I’m visiting him this weekend to show you the rest of his collection. That’s what I’ve got for you. Again, it was great seeing so many of you there, and I sincerely hope to see more of you next year! I’ve already taken way too long to get this story out, so I omitted some images. If you need even more inspiration to come out next year, head on over to this album. 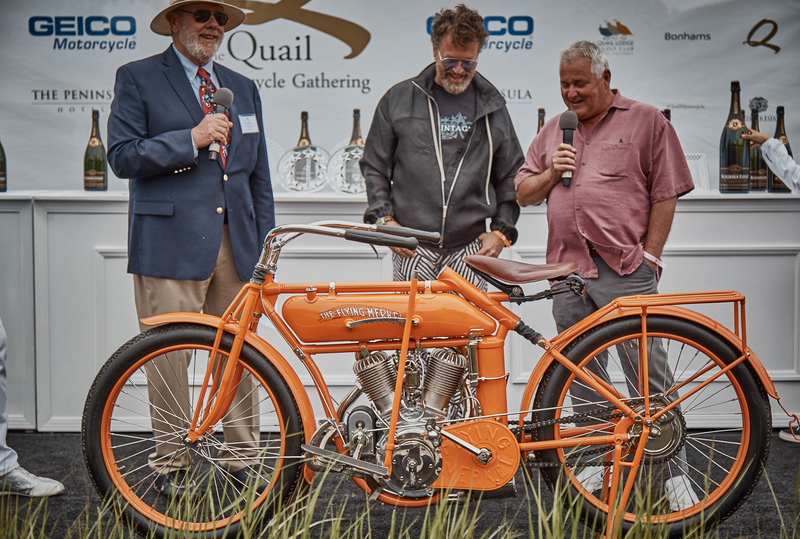 The Quail brings together amazing motorcycles and the fantastic people who are passionate about them, and that’s why it’s a permanent fixture on my yearly calendar. Fly into LA, rent a bike, and make a weekend of it. You won’t regret it.